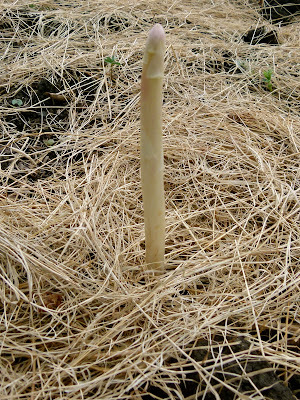 Spears of white asparagus have just begun poking their fine heads above the ground. Its spring at last! After three years of patience, I've been rewarded with my first harvest. I never imagined when I sowed out my seeds three springs ago, I would still be here in Mailhos when they popped out of the ground. I had almost forgotten where I had planted them and was starting to warn them that this year was their last chance to make an appearance, otherwise I was just going to cover them with carrots. 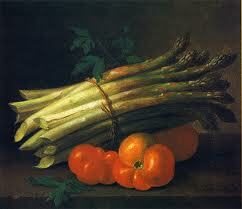 Asparagus likes sandy, poor soil and I have a rich, soggy, clay soil so I just assumed they would not be happy. But they were fed lots of compost, nettle tea and care and now I can just hope for 10 years of my own crop. 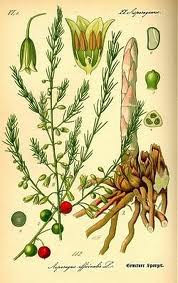 They have spent all this time building a network of roots to store all the huge quantity of goodness needed to make a perfect asparagus spear. Patience such as this makes it one of the most nutritious vegatables to eat as it is brimming with vitamins, folic acid and is an excellent liver cleanser. Even last year when they sent up some shoots, I had to hold myself back to not pick them as it would have weakened their roots so they just flowered into wild fronds as I watched from the side. I suppose this is what makes the first asparagus of 2011 even more special than normal as through, an abnormal demand for patience, I have grown to love and respect this vegetable more than any other in the garden. I feel now that I am really a genius for managing to grow such marvels. Even though my small asparagus patch in the garden will produce enough for a few meals (10m2 asparagus gives back 5 kilos of food every year) we are lucky to have the Landes near us where, I believe, the best white asparagus in France is grown. It really needs to be grown locally as it loses it flavour and saveur so quickly. You almost need to have the water boiling before you go and harvest a couple of spears in order to appreciate the true sweetness of your own. White asparagus demands a little more work from the green variety as the first spears need to be banked up with soil to deprive them of light and blanch them. These are the albino versions and over the border you find the spanish green ones that demand less respect in France. My first asparagus was steamed before arriving through the door with the basket, served with slow melting butter and a leaf of two of tarragon but there are so many wonderful ways of eating this sign of spring. I could eat it every day as long as the season lasts and I never get tired of the the way it stinks your pee! The short six or seven weeks of asparagus time really need to be exploited. First make the aioli by crushing the garlic cloves with a pinch of salt in a food processor. Add the egg yolk, lemon juice and wasabi powder. Once this is all mixed, add the olive oil drop by drop until it starts to thicken and then start to trickle it in until its all used up. Once the aioli is ready, prepare the asparagus. Take the spears and bend the lower end until they snap and peel a little of the skin at the base of each spear taking care not to break them further.